The study of soil is called Edaphology. The weathered layer of the earth crust is called soil. Typically soil is made up of parent material. Organic matter and living organisms incorporate into it. The spaces remaining between the solid particles are filled with water and gases. Plants are anchored in the soil. Soil is a source of nutrients for them. It also acts as a great reservoir for the water. The plants absorb water from the soil. It is also a source of oxygen for the respiration of soil microorganism and the roots of the higher plants. The solid portion of most soils remains fairly constant in volume. But the pore space between solid particles may be completely filled with water after rain. Most plants grow best where soil pore spaces are not occupied by water or air. Soils consist of small fragments of mineral matter. These minerals are derived from solid rocks. This solid rock is present beneath the surface of the earth. A rock is an aggregation of minerals. The breakdown or disintegration of the rock, by cracking through various agencies is called mechanical weathering. The rate of breakdown depends on the nature of the rock material. It is slow on igneous rocks like granite and basalt. Salty and limestone rocks are broken down readily. The agencies or forces of mechanical weathering are: temperature. Rain water. Snow. Wind. plants and animals. Temperature: fluctuations of temperature influence the disintegration of rocks. Rocks expand on heating and contract on cooling. It causes carks in the rocks. Thus the rock is broken down into fragments. Freezing and melting of water further increase weathering. Water expands on freezing. It exerts great pressure and breaks the rock. Rain Water: Rain water brings down the fragments of rocks from the slopes. Water with these fragments has tremendous cutting power. ‘Thus it cuts the rock over which it flows. Snow: Snow move down the rocks from glaciers. It grinds the underlying the rocks. They also mix the mineral fragments of different types. Wind: Wind carries small fragments of the rocks from one place to the other.The fragments strike on the rocks. They cut the rock material. Plants and animals: Plant roots grow into the rocks. It developers cracks in the rocks. Finally, it breaks the rock. Similarly burrowing and hoofed animals also disintegration of rocks. Hydrolysis: The process of decomposition with the help of water is called hydrolysis. Many minerals like feldspar-s and mica are broken down by this action. Hydration: In this case. H and OH ions of water react with different compounds. For example hematitite reacts with water to from limonite. Carbonation: Water reacts with water to form carbonic acid. Carbonic acid reacts with rock. Oxidation: Rocks containing iron (Fe) undergo oxidation It makes the rocks more porous and breakable. Solvent Action: Water is universal solvent. It dissolves some of the mineral matter. Thus it causes chemical weathering. Soil is classified into two types oil the basis of parent material. Residual parent material is formed by the breakdown of socks. Rock minerals are exposed to atmosphere at some places. The intensity of weathering is greatest at these places. Complete physical decomposition and chemical alteration take place at the surface of a residual parent material. The mineral particles become larger with the increase of the depth. Therefore, these particles are less altered chemically. They incorporate in the bed rocks. (a) Colluviall: The soil transported by gravity or wind is known colluviall soil. .
(e) Glacial: Soil transported by glaciers is glacial soil. (d) Aeolian: The soil transported by wind is called aeolian soil. The weathered rock material forms fine earth. Organic matter is added to it. The lichens and higher plants die. Their dead parts get mixed up with rock material. The remains of minerals of plants and their waste products are also added to this mixture. Relative proportion of the soil particles size is known as soil texture. The process of weathering forms the texture of soil. Soil consists of fragments of various sizes. Their volume is 45-50% of the total soil. Soil texture causes variations in the soil water and soil air. Therefore, it indirectly affects the plants. The texture or mechanical composition of the soil determines the amount of water hold by it. It is composed of large mineral particles. Size of its particles is more than 2.00mm. It does not support much vegetation. The size of particles of coarse sand is 2.0— 0.2 mm. Thus it has large sand particles. They are insoluble in water and are chemically inert. Therefore, large pore spaces are present between them. It has good aeration. It is useful for the plants. But excessive drainage occurs in it. It causes deficiency of soil nutrients. The size of particles of fine sand particles is 0.2— 0.02 mm. It has smaller sized sand particles. Its properties are similar to coarse sand. 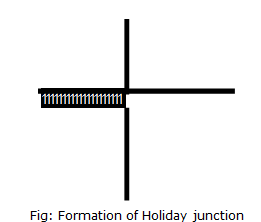 But it has power of coherence (attachment). Fine sand only allow slow water movement. But it does not retain much water. It has small sand particles. Therefore, they retard free movement of water and air. The size of particles of silt is 0.0-0.002 mm. Silt is composed of fragments of rock mineral. The small particles retard the movements of air and water. Silt also exhibits the properties of colloids. Silt has tendency to absorb and retain water. clay is called flocculation. But certain minerals like sodium reverse this effect. It causes dispersion of crumbs. This process is known as deflocculation. A soil in which the sand, silt and clay particles are present more or less in equal proportion is called loam. A loam soil with predominant clay particles is called clay loam. It has more classes. These are sandy, Loamy sand, Silt loam, Silty Sandy clay loam, Silty clay and Clay etc. The activity of microorganisms protozoa and worms (particularly earthworms). .
Aggregation of the soil is essential for soil with fine texture. 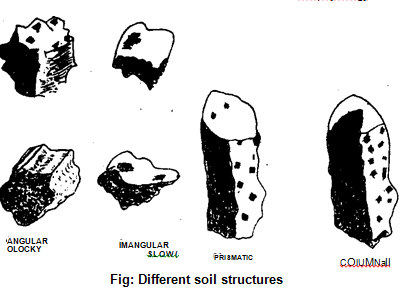 A structured soil has favourable features of both coarse and fine textured soils. Aggregated soil is more favourable for plant growth. Aggregation makes the soil permeable for water. It helps in heat transfer. It improves soil aeration and increases the water holding capacity of the soil. The aggregated soils are not easily eroded by wind and water. There are four types of structure of soil:. 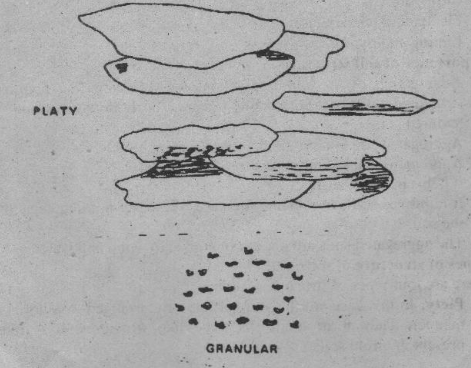 Piety: In this case, all the soil particles are arranged in a horizontal manner. They form small flat plate like structures. It is mostly present in virgin soils. Columnar: The prism like soils in which the top are rounded is called columnar. Prismatic: In this case the top is plane or level. Angular Blocky: When the edges of the cubes are sharp with distinct rectangular faces. it is called angular blocky. Subangular Blocky: When the sub-rounded aggregates are present the aggregates are called Subangular. Crumb: In this case the spheroidal soil is porous. Granular soil is the best soil for plant growth. Run away water: Some of the water drains away along the slopes • after a heavy rainfall or irrigation. This is called run-away water. It is not available to the plant. Gravitational water: Sonic of the water is absorbed by the soil and saturates its upper layers. It percolates downwards through the larger pores between the soils particles due to gravity. Finally it reaches the water table. This is called the gravitational Water. Gravitational water is also not available to the plant. Soil holding water: Much of the rainwater is retained by the soil particles. It makes the soil wet. The amount of water retained by soil after the removal of excess water by gravitation is called the field capacity or the water holding capacity of the soil. Hygroscopic water: Water adsorbed on the surface of soil colloids is called hygroscopic water. It is tightly held by soil. It forms very thin films. It is not available to the plant. Capillary water: The water which fills the spaces between the noncolloidal smaller soil particles is called capillary water. It has the greatest importance for the plant. This water is available to plant. The plant absorbs this water through roots. the molecules of some soil minerals by strong chemical bonds. It is also not available to the root. This is called chemically combined water. Water bible: The water level at some depth from the soil where all pore spaces are filled with water is called water table. It may be present from few feet to several hundred feet. Water rises from water table by capillary action. It is used by the plants. 1. Maximum water holding capacity: The .moisture held by a saturated soil is called maximum water holding capacity. In this case, the pore spaces in the soil are filled with water. It varies from the coarse texture to fine textured soil. Field capacity of the soil: The hygroscopic and capillary water forms the field capacity of soil. It is different for different types of soils. Field capacity varies from 5 to 35%. The clay soil has the highest field capacity. Wilting coefficient or permanent wilting point: The amount of moisture left in the soil alter a plant has permanently wilt is called wilting coefficient. Soil water is now empty for plant. More water must he added to the soil Otherwise, the plant will die. The value of wilting coefficient depends upon the nature of the soil. It is lowest for the sandy soil. But it is highest for the clayey soil. Chemically soil is composed of two parts: mineral matters and organic matters. (i) Primary Minerals (ii) Secondary Minerals. They are reduced particles of the rock. No chemical change has occurred in these minerals. They are also called original minerals. The Important primary minerals are: Quartz, Feldspars, Mica, Amphibole, Pyroxene.and Olivine. Quartz: It is the common form of silica or SKY. It has hexagonal crystals. It is hard and is not affected by most of the weathering agencies. Is found in all the rocks. Feldspar: These minerals form almost half Of the rocks of the crust of the earth. These contain Si02, Al and either K or Na or Ca. The feldspars undergo hydration and hydrolysis with water. Therefore, it undergoes weathering. Mica: It is composed of silicates (Si203) containing Al and one or more of K, Mg. Fe. H. Those varieties.of mica which contain Fe are called biotite or black mica. Those without •Fe’ are called Muscovite or white mica. Amphibole (Hornblende): It is a silicate (Si20;) of Mg, Fe and Ca. Its most varieties are black in colour and produce rust coloured soil. It decomposes readily. Pyroxene: It has hard crystals. They are green or dark coloured. Olivine: It is composed of silicates of Fe and Mg. It is glassy and olive green yellow. It is unstable and decomposes easily. Organic matter is made up of partially decomposed remains of plant and animal tissues and the bodies of Iiving soil microorganisms and the plant roots. The microorganism produces organic matter during decomposition. This organic matter binds the soil matter like glue. Soil becomes more granular due to such substances. Organic matter is important for soil fertility: It is rich in mineral nutrients. Thus it improves the soil conditions. Soil organic matter has colloidal properties. Therefore, it increases the absorptive properties of soil. The organic matter content of the soil is very small in the soils of Pakistan in the plains contain 0.4 to 1.5 O/0 organic matter. Soil has two types on the basis of organic matter. Mineral soil: The soil containing less than 20% organic matter is called mineral soil. The biological component of soil is composed of soil organism and soil organic matter. Soil organisms play an important role in improving soil structure, aggregate stability, soil fertility and weathering of the soil. They affect whole of the soil environment. Thus they indirectly affect the plant growth. 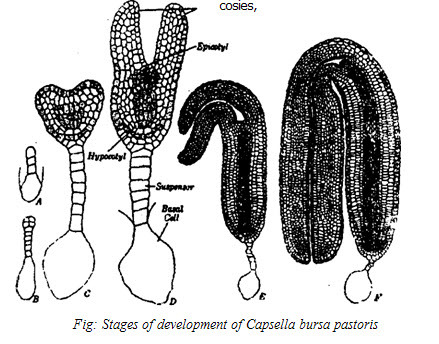 There are following functions of soil organisms:. Decomposition: Soil microorganisms like bacteria and fungi are responsible for decay of organic matter. Thus the elements are changed into the simple forms. Now they are again available to the higher plants. Biological nitrogen fixation: Several groups of bacteria like Azolobacter, Clostridium live in rated and unacrated soils. Rhizobiztni lives in leguminous roots. A number of blue-green algae also live in soil. They fix atmospheric nitogen. This nitrogen enters into organic substances. Thus nitrogen once again enters the organic cycle. Nitrogen fixing organisms of soil increase the soil fertility. Weathering of soil: The larger soil organisms (insects, worms, rodents etc.) cause mixing and weathering of soil. The movement of these organisms changes physical characteristics of the soil. Earthworms bring tons of underground soil above surface of the earth. Their movement in the soil improves –soil aeration. The burrowing habits of rodents (rabbits, hares, mice, porcupine, hedgehog etc.) bring great amount of soil on the surface. Soil formation: Plant roots penetrate the rock crevices. It widens the gap of cervices. It breaks the rocks apart. Therefore, plants roots play a great role in soil -formation. Organic matter is derived from the dead remains of the plants and animals. Organic matter is the most important constituents of the soil. Organic matter -is always present in the soil. But its amount is different in different soils. It varies from a mere trace to 100%. The soil containing 100% organic matter is known as peat. (a) Litter: The material formed by recently fallen leaves is called litter. (b) Duff: It is present below the layer of litter. It is derived from litter. Process of decomposition is started in this layer. (c) Leaf mold: This layer is present below the duff. The decomposition is completed in this layer. This decomposed material is called raw humus or mor. Finally raw humus is mixed with minerals. It is changed into dark coloured amorphous and inert substance known as humus. The rate of humification depends upon climatic and other conditions. It is most active at temperature between 35-40°C and under conditions of good soil aeration, moderate soil moisture’ and presence of calcium carbonate in the soil. Humus is light in weight. Thus it does not easily mix with other soil components. It improves the physiological conditions of the soil. It improves both clay and light sandy soils. It makes the clay soil light. It increases the water holding capacity of the sandy soil. It improves the soil air for the roots. It acts as weak cement. It binds sand and clay particles in the form of tiny balls called- aggregates. These aggregates make the soil compact. Humus forms packing in a solid masse of rocks. Humus separates the clay particles and makes the soil porous. This increases aeration, percolation and absorption of water. Roots easily penetrate into such a sod and bacterial activity increases. Humus is a reservoir of nutrients and oxygen. They are necessary for the plant growth.